I would like to welcome you to the South Brunswick Township Police Department website. Our agency is at the crossroads of New Jersey and the forefront of progressive policing. This website provides the latest information on events and activities around our community. It also gives direct access to the various bureaus within our agency. The strength of our agency is in our relationship with our community. I hope you find the information useful and I look forward to your continued assistance and feedback. The mission of the South Brunswick Police Department is to provide effective and efficient police services, through a partnership with the community, to prevent and deter crime as well as reduce the fear of crime, protect property and individual rights, and improve traffic safety through education and enforcement. RESPECT - We are dedicated to being objective, fair, consistent, and compassionate in the treatment of our community and fellow employees in all of our actions. PROFESSIONALISM - In partnership with the community, we strive to provide responsive, effective, and quality service through teamwork, problem solving, and personal accountability. The South Brunswick Police Department is staffed with the finest men and women in the United States. We will provide a level of service which is second to none. We will deliver a progressive and cost effective law enforcement service as well as identifying and meeting the challenges of our increasingly diverse community. We will continue to seek input from our citizens and employees in hopes of improving the lives of our township residents and guests. To achieve this vision, the South Brunswick Police Department is dedicated to sustaining a quality and equitable work environment that is based on merit, and developing its members through effective training and leadership. Some crimes and incidents that DO NOT require an immediate police response may be reported online. If you wish to file a police report online please click here. You may also report these crimes and incidents by calling (732)329-4646, or by visiting Police Headquarters at 540 Ridge Road, Monmouth Junction. If you believe you may be eligible for a T-Visa or a U-Visa, and need a U-Visa Certification or T-Visa Declaration, please click here for more information. For those forms in Spanish, please click here. For a copy of our driver communication visor card for the hard of hearing, please click here. The Chief of Police is head of the police force appointed by the Township and responsible for the routine day to day operations of the police department. Acting to preserve public peace, the Chief oversees 87 Full Time Officers, 4 Special Officers as well as clerical staff from the police department. The overall responsibility of the chief is to duly administer and enforce the laws in order to protect life and property, and to prevent crime. Chief Raymond J. Hayducka has been in law enforcement for 29 years. He oversees the South Brunswick Police Department, the Township Transportation Division and the Office of Emergency Management. During his tenure as Chief of Police, the South Brunswick Police Department has obtained the prestigious state and national accreditation. Under Chief Hayducka's leadership South Brunswick has been recognized as the first township in the state to become dually certified.ws in order to protect life and property, and to prevent crime. Chief Hayducka started his law enforcement career with New Jersey Department of Corrections serving as a corrections officer. He also served in the City of East Orange as a Police Officer for two years prior to joining the South Brunswick Police Department in 1989 as a patrolman. 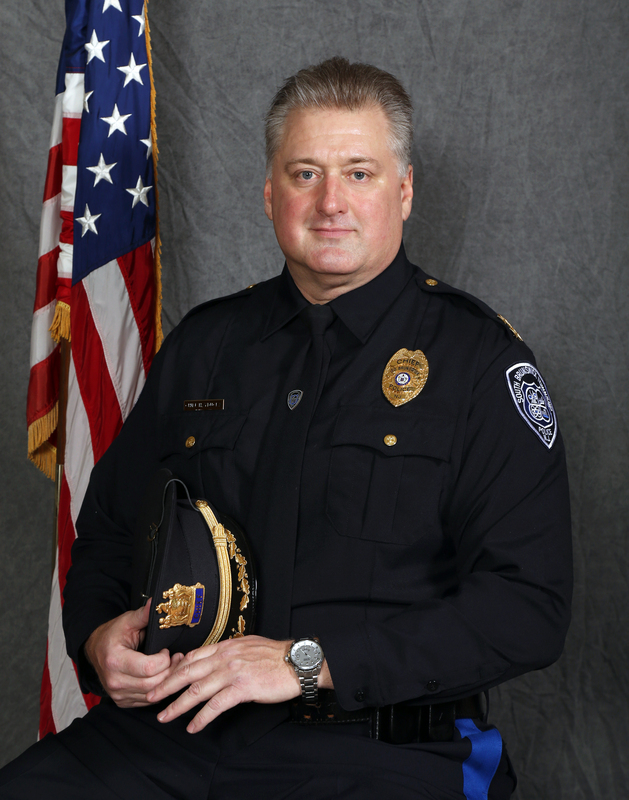 He worked his way through the ranks and was appointed Chief of Police in 2005. Chief Hayducka holds an AAS degree in Criminal Justice, BS degree in Criminal Justice/Safety and Security Management, and a Master's degree in Criminal Justice. He also has a certification in Labor Relations from Rutgers Public Employment Relations Commission and a certification in Public Safety Mitigation from the Richard Stockton College of New Jersey. Chief Hayducka is a Certified Public Manager and Certified Advanced Chief Law Enforcement Executive. The New Jersey Department of Community Affairs has consulted with him on law enforcement-related matters. Chief Hayducka has even worked as a police consultant for police reorganizations and mentors Police Executives. He was also part of a working group appointed by New Jersey Attorney General Paula Dow, to review and update the Internal Affairs Guidelines in 2011. Chief Hayducka has served on numerous discussion panels in New Jersey and other states regarding law enforcement topics. Chief Hayducka has written and authored numerous publications on various police law enforcement subjects. He has also served as an adjunct professor at the university and county college level. In addition, he has instructed and taught Police Chiefs and ranking officers throughout the State of New Jersey and the United States as he is the former president of the New Jersey State Chiefs of Police. Chief Hayducka currently resides in South Brunswick Township with his wife Suzanne.